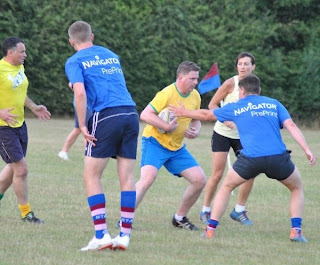 The eagle-eyed amongst you will have noticed a lack of updates about the progress of yours truly on the Touch Rugby fields of Buckinghamshire this summer and may have assumed that my silence was a consequence of poor performances and disappointing results. This week saw the mighty Billy Who? approach the last game of the season having played 7, won 5, drawn 1 and lost 1 – needing only a draw with Chairman’s Choice to secure a second successive league title – and the fact that our opposition could also take the title with a win meant that it was very much a “winner takes all” encounter. It was a desperately tight affair – we started very well but then tried to play too much “Rugby” and not enough “Touch” whilst our opposition – boosted by the arrival of several young, fit and quick ringers from another team and (it must be said) some erratic refereeing decisions – stuck to the basics much better than we did and clawed their way back into the game. With a minute or so to go, and 6-7 down, we secured possession and it looked like a late escape might be on the cards but basic errors let us down and we had to concede that on the night (and consequently the season) we were second best. As seasons go, 2013 (my 8th) might best be described as enjoyable but frustrating. As a team we only really hit the heights of previous years occasionally – suffering from changing personnel each week and often simply having too many players to ensure any kind of continuity. On a personal level I felt I contributed very little this year other than 100% attendance – largely due to an embarrassingly disgraceful lack of fitness on my part. I like kicking a rugby ball around a field and chasing it - an enjoyable way of improving your fitness. It takes your mind off the pain and suffering and you develop your skills as well.